Although only Forstner bits are present for larger size holes, the size ranges overlap so .. Under what circumstances would I choose which bit? and why? These bits are excellent if you need a relatively shallow hole with a flat bottom and crisp, clean sides. The center spur keeps the bit on track to your chosen centerline without walking into porous grain. Forstner bits are best suited for using in the drill press where they can easily be kept on track. Forstners are suitable for hogging out waste in mortises. I have also seen them used for half-blind dovetails. Note that these can have a tendency to follow an adjacent hole and be pulled off course if there is too much overlap. However, they are more forgiving in this aspect compared to the other bits described below. Augers have the advantage of having the small screw "snail" tip that draws the bit into the wood you are drilling. They have a tendency to be a bit coarse compared to brad-point bits, though chairmakers do use them for drilling tenons. Non-powered ones are used quite often with braces, and I can attest that they can give great results for furniture. Personally, I have used these for drilling holes in my workbench for holdfasts. Contractors use them all the time for drilling holes in wooden studs for running wiring. Since they have a lead screw to draw the bit into the wood, they work best at low RPMs and can be downright dangerous at high RPM. Spade bits are great for quickly cutting a hole through a board. They are very coarse, but man, do they chew through wood fast. Generally not used in fine woodworking due to the coarseness. Also, they are very prone to falling into adjacent holes, so bear that in mind if you have any overlaps. These bits are great for drilling smaller-sized holes with minimal tearout. The brad point ensures that the drill centers where you want it instead of skittering around to stick in porous grain. The edges of the bit on the pointy end have spurs that shear through the face of the wood, leaving a nice, usually tearout free surface. Also, the sides of the hole will be very crisp and clean. The brad point is also useful for drilling so that the brad just sticks through the other side, then flipping the piece and completing the hole. This way, you get tearout-free sides on each face. These bits have a strong tendency to deflect into adjacent holes if there is overlap, so bear that in mind. Drill bit sets seem nice since you have a wide variety of sizes to choose from all in one place. However, most craftsmen will use only a portion of the bits and never touch some. There is something to be said about only buying the tools you need for the job - often you end up spending less in the long run since you buy less tools. However, if the price is right, then a kit is a good choice. Excellent answer already from grfrazee but I wanted to add a few details. Although there is some overlap in sizes with this kit (and many others) often the bits don't overlap in function, so the size overlap is quite deliberate. They only duplicate function if you think of drilling one 1/2" hole as the same as drilling every 1/2" hole. For example, if you want a shallow, flat-bottomed 1/2" depression in a piece of wood the Forstner is the only choice here. If you want to drill 1/2" though-holes in a beefy workbench for bench dogs or holdfasts then the auger would be the one to pick. For just drilling a simple hole through the thickness of a board then the spade bit is sufficient (although both the Forstner and the auger bits can be used for this as well, where appropriate). 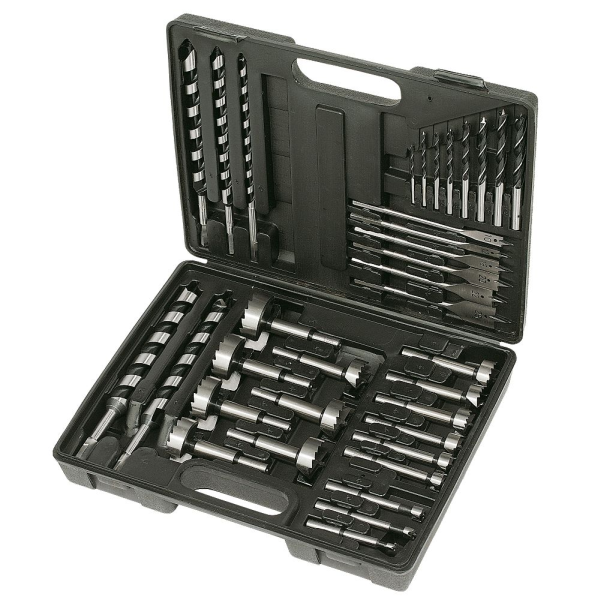 Note that the bits in this set are not truly Forstner bits. As indicated by the toothed edge these are multi-spur bits of a similar type but not the original Forstner design. As mentioned Forstners are perfect for flat bottomed holes (that is except for the central depression left by the "gimlet point"). They also drill equally well irrespective of grain orientation. In addition, they are suitable for boring partial holes, i.e. where you want to drill a scallop from the edges of a board. Important to stress that these are basically intended for use only in a drill press. You can use them with a handheld power drill, but it's risky and not recommended practice. The central threaded point on these is called the lead screw. In addition to allowing the bit to be centred accurately on a mark when commencing drilling these actually pull the bit through the wood, reducing the force necessary for drilling quite considerably; and as a result great care should be exercised if drill speed is high. Due to their overall form they excel at drilling deep holes with dead-straight sides, the entire length of the bit if needed. Note: not well suited to boring into end grain as the lead screw can easily get clogged with swarf and cease to draw the bit into the wood. These get a bit of a bad rap for leaving surface tearing around the hole and this can be a problem, but not all spade bits are created equal. On cheap ones the flutes to either side are dead flat across their tops and these are more prone to splintering surface wood fibres. Better ones have angled faces on the flutes (e.g. 10°) and may additionally angle upwards from the centre slightly to further improve cutting performance. Other well-designed spade bit have little spur-like projections at the outside shoulders to help cut a sharp-edged hole; where a purchased bit doesn't have these they can be filled into the profile using a needle file or slipstone. One advantage of spade bits over the previous two types is that the angle of the hole can be changed slightly during drilling if needed, something the design of an auger bit will specifically not allow. As with the spade bits there are some variations in design for these. Some have a central point only, with straight or angled shoulders, others have a spur on each outside edge. No real overlap with other bit types here as these are the bit of choice for drilling deep, smaller-diameter holes in wood. In particular, something not mentioned regarding augers is their length and diameter. They can be much wider than other bits, allowing for wide, deep holes. At a box store you're likely to see augers in 18 inch lengths or even longer, they're very good for drilling deep holes without flexing like an extension rod might. They may not be as fast as a spade bit but they are more stable and will keep you drilling (mostly) straight once the lead screw has bitten. They're what I would use for drilling through thick stock like 4x4s. I would also add that spade bits tend to "wobble" and will often not make a perfectly circular hole; for this you want either a hole saw or a forstner/sawtooth bit depending on depth and diameter of the hole. For fine woodworking, as I believe others have mentioned, you will likely be using brad point or twist bits and forstner (and similar), because they will get you a more uniform hole with less tearout. Spade bits may be used, especially if they have a spur on the edges to help reduce tearout, and you make a solid backing for your piece being drilled, also to reduce tearout. Masking tape can be very useful on the entry hole as well, both for positioning and for reducing damage to the entry surface. What tools/methods I could use to create a small circular recess? How do I drill greater than 7 inches in from the edge of my sheet of wood?